If adult responsibilities claimed you before you had the chance to plunk down your money on a sweet sports coupe, the upcoming 2019 Ford Edge ST lets you live out your adolescent adrenaline fantasies without having to worry about finding space for your kids’ baseball equipment. Ahead of its launch later this summer, Ford dropped some additional details about the Edge ST that appeal to both sides of your proverbial coin. The Edge ST’s 2.7-liter twin-turbocharged EcoBoost delivers best-in-class output at 335 horsepower and 380 lb-ft of torque. Optimizing that output is Sport mode, which can be engaged by pressing the “S” button in the center of the Edge ST’s rotary shifter. When the Edge ST is set to Sport mode, the instrument cluster’s digital components change to a tachometer; active noise control allows more of the EcoBoost’s sound to enter into the cabin; the eight-speed transmission can be fully controlled via steering wheel-mounted paddle shifters; and the engine and transmission are configured for more responsiveness, including revised electronic throttle programming for the engine and rev-matching for smoother shifting. The 2019 Ford Edge ST will also be offered with new Electronic Stability and Traction Control Modes, which Ford will detail closer to its launch this summer. 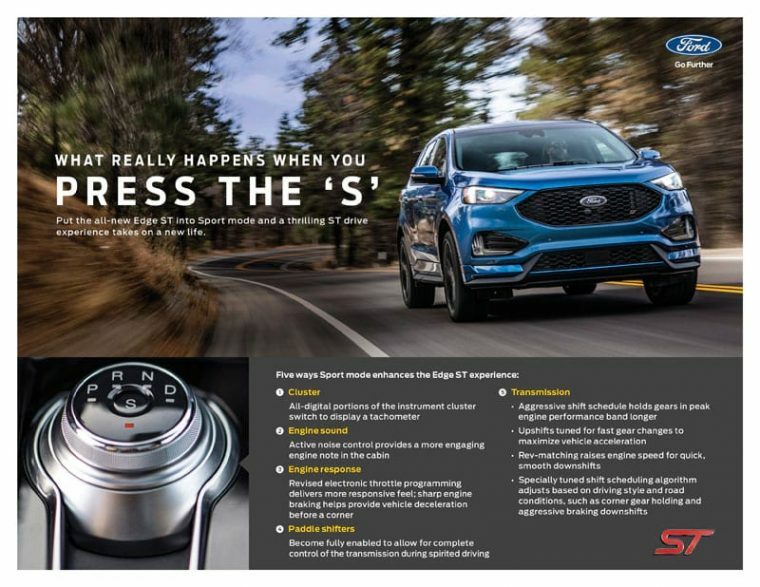 In terms of safety, Ford also revealed that the new Edge ST will be offered standard with Co-Pilot360, its advanced suite of driver-assist technologies. Ford Co-Pilot360 will include Automatic Emergency Braking with Pedestrian Detection, Blind Spot Information System with Cross Traffic Alert, Lane Keeping System, Auto High Beam, and Reverse Camera, making the Edge ST among the safest vehicles on the road. See? Perfectly justifiable as a family vehicle.